Well done to all of the children who have already signed up for the Summer Reading Challenge at Fareham Library, lets make this the most successful year Harrison has ever had. 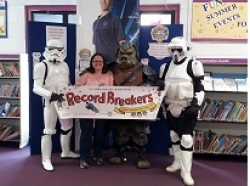 As you can see I have been meeting with some characters from Star Wars from the garrison located at www.ukgarrison.co.uk while at the library and I have been allowed to sign up to do the challenge too! I can’t wait to hear about what you have been reading this holiday. Happy Book Time and have a great summer.